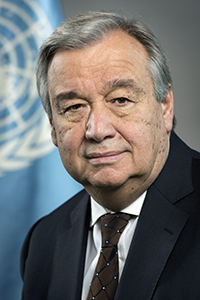 Antonio Guterres, current Secretary-General of the U.N. The head of the administrative set up of the United Nations is called the Secretary General. So far, all the past and present Secretaries-General have been males. No female has ever occupied that position. The Secretary General is elected by a two-thirds majority of the members of the General Assembly. The current Secretary-General of the united Nations Organization is called Antonio Guterres. He comes from Portugal. He officially assumed his position on the 1st of January, 2017. The Secretary-General is responsible for steering the administrative set of the United Nations, which called the Secretariat.In fact, he is the head of the Secretariat and supervises its activities. The Secretary-General is mandated to write an annual report about the activities of the United Nations and other specific matters of the organization. These reports are then submits to the General Assembly. The General Secretary is expected to report to the Security Council any flash points in the world where, in his opinion, may threaten the peace and security of the world. He appoints the staff of the Secretariat according to the laid down procedures of the United Nations. Staff members are selected from every part of the world, as long as they qualify by the standards of the United Nations. An annual budget is expected to be prepared and submitted to the General Assembly and the Secretary General is expected to supervise the preparation of that budget or better still to ensure that it is reader for approval. The Secretary-General must alert the Security Council about any issues that in his opinion constitute a threat to the peace and stability of the world. 1. a. Describe the status of the Secretary General of the United Nations. b. What five functions are performed by the Secretary General? 2. Examine six functions of the Secretary General of the United Nations. 3. State six of the functions of the Secretary General of the United Nations.